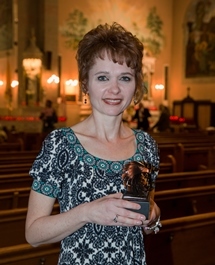 She joined this year’s individuals and organizations honored in 11 other categories at a Mass and awards presentation held April 29 in St. Adalbert Basilica in Buffalo. Prior to joining Daemen, Witherell served as assistant to the president for communications at SUNY Buffalo State, from where she earned a master’s certificate in strategic public relations and a bachelor’s degree in communications. A graduate of the Western New York Consortium of Higher Education’s Women’s Leadership Institute, she was also previously director of public relations at Hilbert College. Witherell’s professional work has been recognized with many Excalibur Awards from the Public Relations Society of America Buffalo Niagara Chapter and the Council for Advancement and Support of Education. She resides in West Seneca.